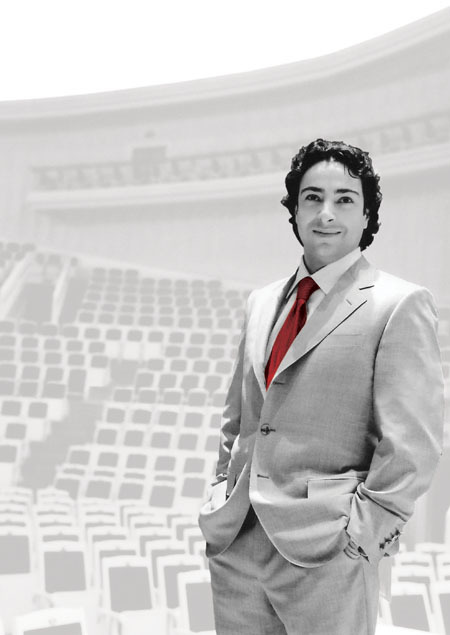 MUSIC FOR Galway is proud to announce that Metropolitan Opera star Rodion Pogossov has agreed to come to Galway to celebrate MFG’s 30th Anniversary Season on Saturday October 16, at the Town Hall Theatre. On the night Mr Pogossov will be joined by superb Russian soprano Evelina Dobraceva and one of Ireland’s finest and most versatile musicians, pianist Dearbhla Collins. The Music for Galway 30th Anniversary Fundraising Gala - a glittering event celebrating all that is best in music in Ireland and beyond - marks three decades of international concert seasons in Galway, and on this milestone occasion, honours will be conferred on the NUI, Galway, for its 30 years of generous support, and Erika Casey, founder member of Music for Galway and most loyal audience member for many years. The event sees Metropolitan Opera baritone Rodion Pogossov returning to Galway after his appearance here last January in Music for Galway’s Schumann Festival. Soprano Evelina Dobraceva makes her first appearance in Ireland at this time. Speaking by phone from his native Russia, Rodion Pogossov took time out from his busy schedule to talk about his forthcoming Galway performance. He began by disclosing that he did not originally plan on being an opera singer. “Initially I was training to be a musical actor,” he explains. “I was doing voice lessons and my teacher told me I had a voice, it was only then I began to discover classical music - before that I was always in the theatre and never went to opera. Mr Pogossov reveals that Milos Forman’s Oscar-winning film Amadeus was a key early influence. “That film impressed me so much when I first saw it aged 17 or 18,” he recalls. “That’s how I first started to sing and how I first discovered classical music. I was so impressed by this movie; and when I heard Mozart’s Requiem for the first time I was really in shock. So how did this young baritone from Moscow wind up at New York’s famed Metropolitan Opera? “It was in 2001 and they were having masterclasses in Moscow and they invited me to audition for their Young Artists Programme,” he explains. “I did three auditions and after the final one they offered me a two year contract and of course I accepted. Mr Pogossov readily admits that enrolling in the Met presented him with a steep learning curve. “It was pretty hard because first of all I didn’t speak any English and I’d never been separated from my family for such a long period before, so that was stressful,” he says. “Also, my technique wasn’t so good because I had just started singing. Then you see all these great singers on the stage and what they are doing and I realised I knew nothing about singing yet, that’s how I started developing. Pogossov evidently learned a great deal and he has gone on to prove a sensation over a varied repertoire, garnering rave reviews for such roles as Eugene Onegin, Papageno in The Magic Flute and – his personal favourite - Figaro in The Barber of Seville. Galway audiences are clearly in for a real treat when Pogossov comes to perform here, and he himself is looking forward to renewing his acquaintance with the city, retaining fond memories of his previous visit. The programme for the upcoming gala concert will see Mr Pogossov and Ms Dobraceva sing a selection of famous arias and duets from such well-loved operas as The Magic Flute, La Boheme, Barber of Seville, and Die Fledermaus, among others. While the music itself promises to be a feast for the ears, the evening has much else on offer. John Behan RHA has donated a wonderful sculpture entiled ‘Cellist’ inspired by ConTempo cellist Adrian Mantu. This will be auctioned off on the night along with jewellery donated by Cobwebs. Proceedings kick off with a pre-concert reception at 7.15pm followed by the concert at 8pm. Fantastic raffle prizes include an original John Behan print, a night at the Renvile House Hotel, and tickets to the Live from the MET at The Eye cinema, including champagne from the g hotel. So, join Music for Galway for a night of sparkle, an evening of operatic duets and arias in the company of world famous performers, on Saturday October 16 at the Town Hall Theatre to celebrate all the artists, volunteers, sponsors, and audiences who make it all possible. Tickets are €30 and are available from the Town Hall Theatre (091 - 569777 or online at www.tht.ie ). A special Galway weekend package including tickets and accommodation at the Park House Hotel is also available; contact Music for Galway on 091 - 705962 for details. Page generated in 0.1851 seconds.